We’re now only a few days away from the premiere of Marvel’s Jessica Jones, the latest Netflix series on the way to the Defenders team-up. The main villain in the show will be Kilgrave, played by David Tennant. He is based on the Marvel Comics character Zebediah Killgrave, who goes by the alias The Purple Man (mainly because of his purple skin). The Purple Man’s super ability is a powerful and sinister one: he can control people’s minds. Contrasting with a noble telepath like Charles Xavier, though, Killgrave is wicked and uses that power for ill. His character has become much darker in the 21st Century, but he has not yet really been one of the bigger villains of Marvel. Here are five noteworthy appearances in Marvel Comics history of Zebediah Killgrave, The Purple Man. Many people don’t realize this but The Purple Man was one of Daredevil’s first villains, way before Bullseye and The Kingpin. 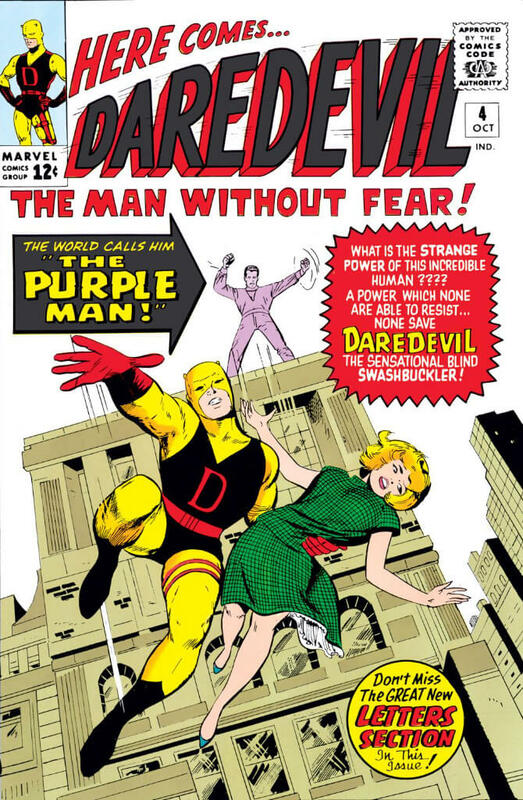 The first appearance of The Purple Man came in just the fourth issue of Daredevil. He was created by writer Stan Lee and artist Joe Orlando. Daredevil #4 also gives us the origin of The Purple Man. Back then, Killgrave wasn’t as sadistic and depraved as he would become in modern times. Like most villains in the original Marvel run, he was trying to gain money and power – but in stories that were geared at least partially to kids. Still, much of The Purple Man’s look and personality comes from this first issue. This comic is significant for a few reasons, even though it hasn’t aged especially well. The first reason is that the story was written by Frank Miller, early in his career at Marvel. Miller also supplied the fantastic looking cover (the interior pencils were not by Miller, though, but Herb Trimpe instead). 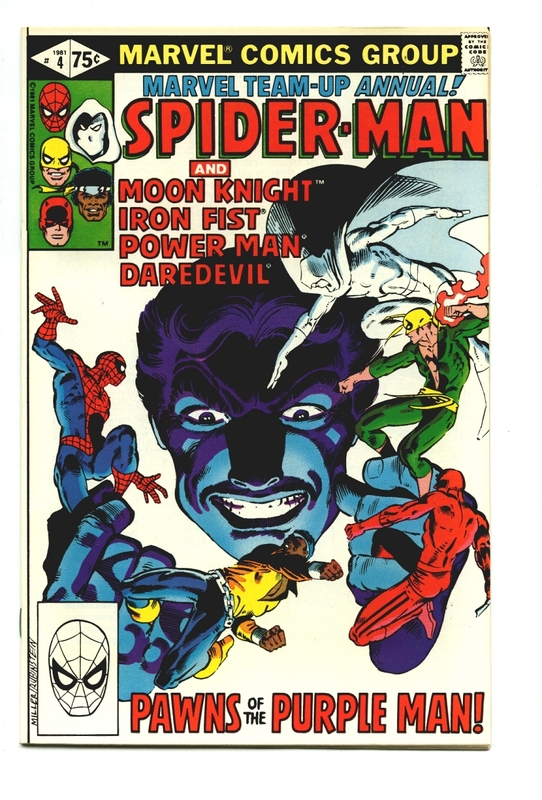 The second important element was that this was one of the first times that there was a team-up of all of the “street-level” Marvel heroes: Spider-Man, Daredevil, Power Man (Luke Cage), Iron Fist, and Moon Knight. The last three characters were still relatively new at the time, and Miller himself would be largely responsible for formulating the gritty, street aesthetic in his work on Daredevil in the 1980s. The Purple Man proves to be a match for the many heroes in this issue, and it’s actually Moon Knight who finally bests Killgrave. In this early graphic novel featuring the Avengers, the main villain is actually Dr. Doom. In the story, he figures out a way to mind control everyone on Earth so that he is Emperor of the world. Dr. Doom, the ruler of an entire world!?! Why hasn’t Marvel tried retelling that story, in maybe a war that was… I don’t know, secret or something? 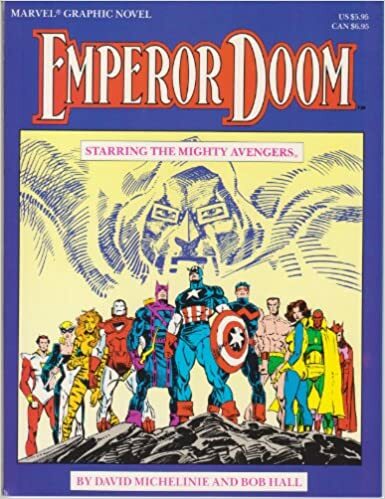 In any case, in Emperor Doom, it was The Purple Man being controlled and manipulated by Dr. Doom so that everyone was loyal to Doom (in a similar way to how Doom’s power in Secret Wars stems from the Molecule Man). Ultimately, the Avengers overcome Doom’s control, mainly through the efforts of Wonder Man. Even though Killgrave is not the central antagonist here, it was one of the first times that his power was fully harnessed and showcased. It’s also a pretty excellent story all around. Mark Waid recently concluded his long run on Daredevil (much of it with artist Chris Samnee), and he made The Purple Man a big part of the tail end of this run. 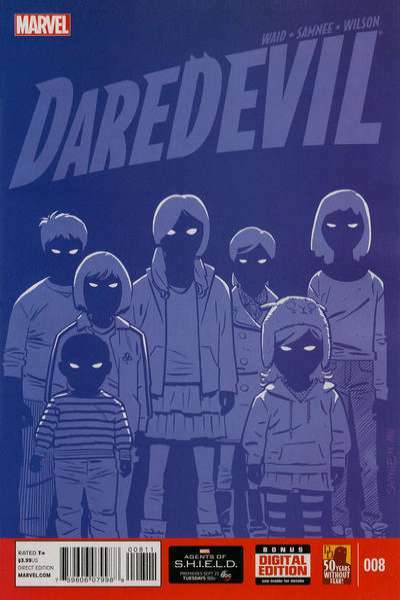 In Daredevil #8-10 (volume 4), Daredevil faces off with The Purple Man as well as The Purple Children, offspring of Killgrave who have turned on their father. Then in the final arc of the Waid/Samnee era, Killgrave controls Leland Owlsley (aka The Owl), who has gained the power to survive through any technology, in order to destroy Daredevil. With the help of The Owl’s daughter, Jubula Pride, Daredevil is able to beat The Purple Man. Still, these stories show the insidious ways that Killgrave can control people in order to battle his foes. The stories that really put The Purple Man into the realm of comics’ worst scumbags, though, come from Alias, the comic by writer Brian Michael Bendis and artist Michael Gaydos that centered on Jessica Jones. In this story, The Purple Man has been controlling the fringe hero Jessica Jones (who operated as Jewel) for many months, making her a psychological wreck. It appears that the Netflix series will be largely based on Alias, which explains why many feel like it will be the darkest property set in the Marvel Cinematic Universe yet (even darker than Daredevil). It’s hard to be a “fan” of this version of Killgrave, but he has never been a bigger threat than in Alias. All of the episodes of Marvel’s Jessica Jones first season will be released on November 20th. While The Purple Man has been a relatively obscure villain until now, he is set to be much more visible soon. So if you’re curious to read more stories featuring Killgrave, check out some of the above comics.